Why use signage systems in retail? 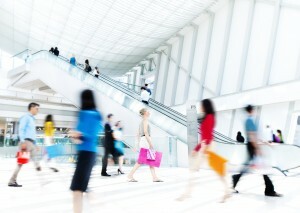 Digital signage is a powerful tool, especially in the retail world. Digital information displays can be used throughout the store for branding, merchandising, promoting products and entertaining customers. Not only are they visually appealing, but they give retailers the opportunity to improve a customers shopping experience. is more likely to buy from the store. Digital displays offer the correct software in order for you to change information immediately, such as promotions for products or for specific customers. Unlike static signage that may have been in place before, this can be a much less time-consuming way of getting your information across. Digital advertising screens allow advertisers to buy screen time for their product, meaning driving more sales at the point-of-decision. Factors such as the size of the screen, type of content and circumstances are varied, but the most successful networks are always treated the same as other in-store mediums. This is also a means of making money, as retailers sell advertising space to their suppliers. Digital signage can complement current marketing and merchandising strategies to further enhance the shopping experience, build loyalty, and also increase sales. The use of digital signage to provide relevant information to an audience near the point of purchase has allowed retailers to generate higher brand awareness and uplift their sales. Retailers will typically face high levels of employee turnover. Digital signage can raise awareness about current job vacancies or provide staff training, improving employee competence and job satisfaction. Any comments on the advantages we have come up with? Tell us your views in the comments box below. 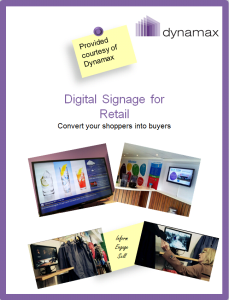 Dynamax is one of the first and longest standing digital signage providers in the industry. We have a range of expertise and knowledge to help you enhance your business, and create a digital signage solution for your business requirements. For more information about our digital signage for retail, download our complimentary white-paper by clicking on the image below. Our case-studies are also available for you to read. This entry was posted in Digital Signage, Retail, Tips and advice and tagged Digital signage retail, digital signage software by Dynamax. Bookmark the permalink.